By joining us for this training, you will ensure that your agency is offering accurate and effective interpretation to its limited English proficient HIV/AIDS patients in a culturally sensitive manner. We encourage you to increase the skills of your bilingual/bicultural staff members serving people living with HIV and AIDS. A. The Mental Health Consortium, is a group of local mental health professionals and advocates within the Congresswoman’s District and Los Angeles area, who work together to advise on issues related to mental health and policy. The MHC is a critical component to Congresswoman Napolitano’s work in addressing the issue of mental health and helping to rid stigma. Below is the flyer with the event details. 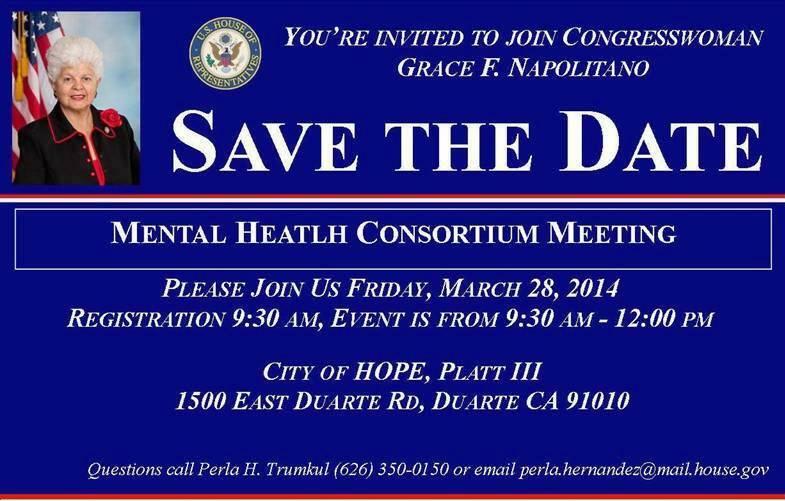 To RSVP, please contact Perla H. Trumkul at perla.hernandez@mail.house.gov no later than Monday, March 17, 2014. You’re invited to join the Office of Disease Prevention and Health Promotion (ODPHP) for a Healthy People 2020 progress review webinar. This webinar is focused on tracking and measuring the progress of select Healthy People 2020 objectives—in this case the early detection, prevention, and treatment of substance use and mental disorders. Healthy People is an initiative of ODPHP that provides science-based, 10-year national objectives for improving the health of all Americans. For 3 decades, Healthy People has established benchmarks and monitored progress over time in order to encourage collaborations across communities and sectors, empower individuals toward making informed health decisions, and measure the impact of prevention activities. Implementing health information technology to address the opportunitiesand challenges of health care reform. Expanding electronic health information exchange to support care coordination across physical and behavioral health care, social services and criminal justice systems. Innovative mobile applications and other types of technologies to enhance consumer recovery and wellness. Updates on national and statewide policy developments guiding the use of electronic health record systems and health information exchange. New technology and policy solutions to address privacy and security concerns in an increasingly complex health care environment. Organizational examples of how to use electronic data effectively for decision support and quality improvement. Participate in discussions and network with your colleagues! 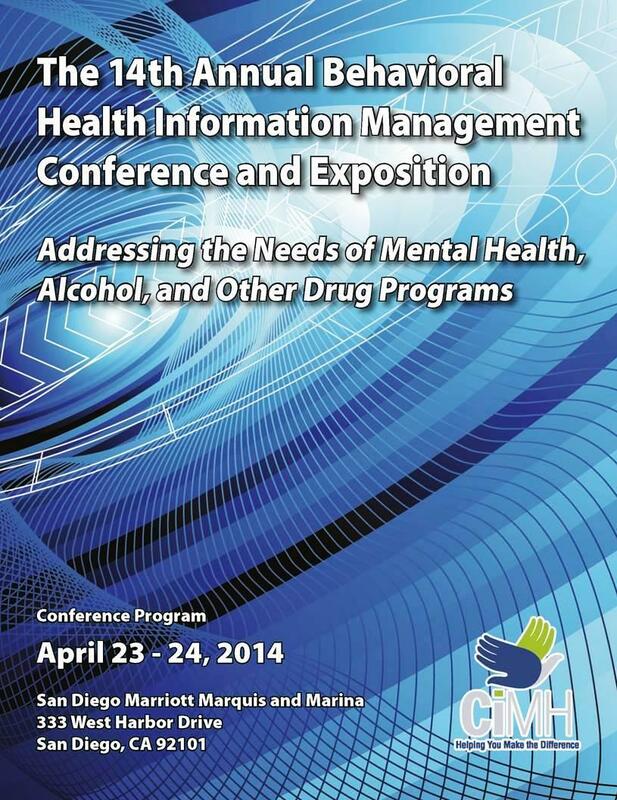 Meet the major software companies serving mental health, alcohol, and other drug programs and evaluate their products – all in one exhibit hall! The Los Angeles HIV Mental Health Task Force includes treatment providers as well as persons living with HIV/AIDS who advocate for the mental health service needs of persons living with HIV/AIDS in Los Angeles County. The Task Force meets every second Wednesday of the month from 9:30-11:30 at The Village at Ed Gould Plaza – 1125 N. McCadden Place, LA, 90038.